How was your weekend? It was an exhausting but fun one filled with makeup gigs. I'm excited about how everything turned out. The Indian wedding makeup I did Saturday turned out lovely. We did a smokey blue eye using silvers from the MAC Holiday smokey eye palette and deep truth e/s from MAC. This coordinated beautifully with her Sari. Saturday night, the Makeup Bar was awesome! My assistant Joy and I made over 15 women and they all looked fab! Talk about instant transformations! The shoot on Sunday was also great. I ended up doing a smokey eye look per the photographer's request. 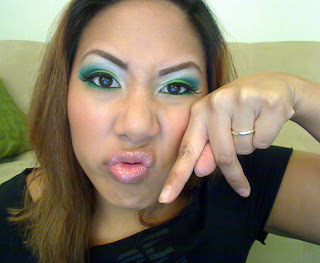 This week I'm planning on doing the more creative type makeup. Thanks for your suggestions! I finally uploaded my tutorial from my Manish Arora dupeable look. 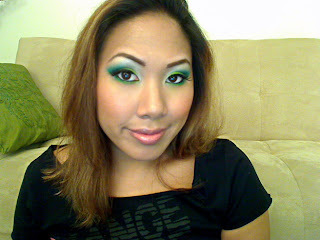 I got a bunch of requests to do this look after my A-Design brushes video. 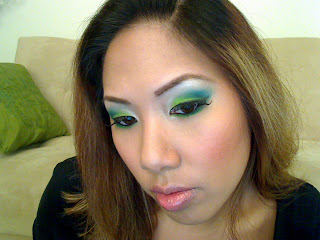 I pretty much decided to create the look when I missed out on the limited edition Manish Arora collection from MAC. As you can see, you don't need the products to create a bright and fun look. You know that blues and greens are my favorite. Hope you enjoy! Ren ren, I LOVE THIS LOOK!!!! I love these colours and you look adorable! WOW you never ever fail...LOVE IT!!!! wow! babes! post pics of the indian wedding! i wanna see i wanna see! gorgeous look ren - love the way the blue looks on you! gorgeous as always sis! miss u! beautiful! love how you blended everything ! Girl you are too beautiful! love those eyes. you have made me an eyeshadow queen. i just watched this one YouTube. LOVE IT!!! I love that look, the colors really look great with your eyes!